This workshop is concerned with sampling challenges, modeling and simulation for data-rich applications in high dimensions. It brings together mathematicians, statisticians and computational scientists to explore the interplay between computational applied mathematics and data science. On the agenda will be novel developments in the study of complex phenomena based on data-analytic techniques, such as efficient calculation of ergodic (long term) averages and statistical inference under a wide range of geometric, physical and analytical constraints. 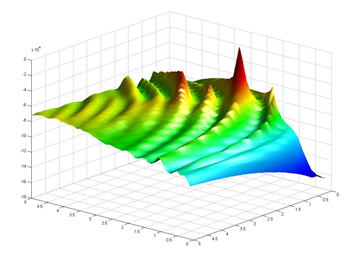 In applied mathematics and computational science, in particular in molecular modeling, image analysis and geosciences, among others, many objects of interest are high-dimensional and stochastic, and a wide variety of techniques have been developed for sampling and approximating the quantities of interest. Similar issues arise in the area of data science and statistical modeling, where learning problems in the presence of high-dimensional data require efficient computational algorithms for sampling and approximation. The workshop will focus on recent advances in the design of rigorous discrete-dynamics based sampling approaches, algorithms development for large-scale data analysis and stochastic dynamical systems, scalable and rigorous numerical methods for stochastic differential equations and sampling from high-dimensional distributions, and exploitation of low-dimensional structures in high-dimensional data and stochastic dynamical systems for model reduction and efficient Monte-Carlo schemes. The meeting will foster the interchange and deployment of the latest methodologies for sampling and approximation.